Jeep CJ-5 (1976-1983) w/ Model 20 Rear Axle; w/o Quadra-Trac. Jeep CJ-7 (1976-1981) w/ Model 20 Rear Axle; w/o Quadra-Trac. Jeep CJ-8 (1981) w/ Model 20 Rear Axle; w/o Quadra-Trac. Replaces original tapered axles with flanged one-piece axle; Stamped side of bearing faces differential. 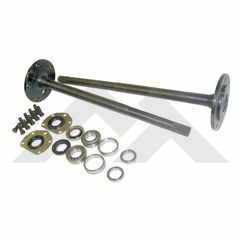 Kit includes all parts necessary to replace both Left and Right Axles; Includes Left and Right Axle Shafts, Bearings, Seals, Spacers, and Wheel Studs.